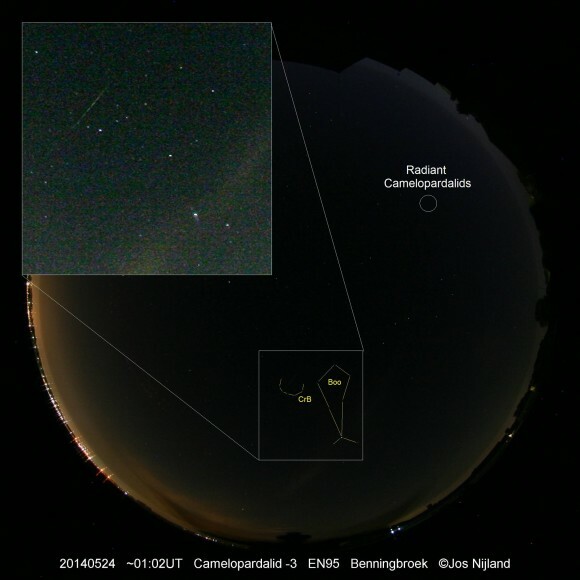 Camelopardalids did not put on their predicted show for observers in N. America or Europe, at least. What the heck, astronomers? Meteor rates in many places were no more than 5 or 10 per hour. … Another possibility is that the shower is not a dud, just delayed. If models mis-located the debris zone, an outburst could still occur later on May 24th. Overall, a disappointment to many. Weather reports for our area 20 miles north of Kingston, Ontario didn’t look promising, but I set my alarm for 2:00 a.m. to check. Hit the snooze button, then dragged my groggy self out of bed. Clear sky! Bundled up with warm clothes and big klunkety boots that would keep my feet warm and dry in the rain soaked grass, collected camera and tripod and headed out to where I had a view of Camelodorkus just over the trees. Set up and waited. Held my breath with anticipation. And waited. Fiddled with the camera. Whistled to the whipporwill. And waited. Meteor “shower” my ***! Saw one fast little meteor whizz across Ursa Major, watched the ISS and a couple of satellites come over, but meteor “shower”? Nada. Once again my hopes for lovely sparklies was dashed like fine crystal over a rock cliff. This sleep-depriving bone chilling stiff neck inducing event of major disappointment brought to you by the same sadistic fiends who promised me that Comet Eyesore would be the comet of the century. Pfft! Phooey! Rats! This all sky image from Europe last night might show a Camelopardalid. 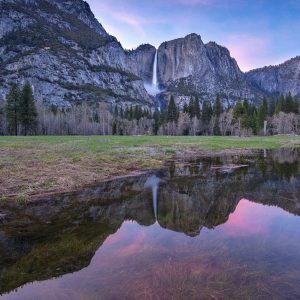 Via cosmos4u on Twitter. 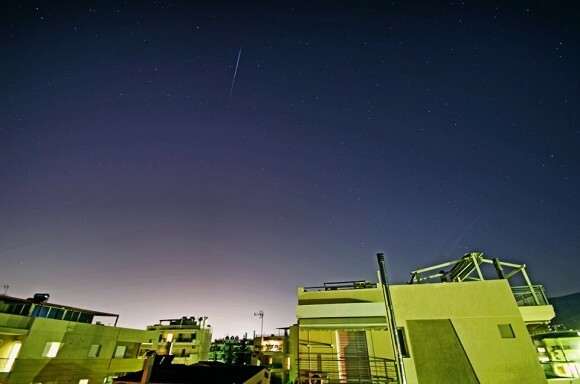 Steve Lacy caught this beautiful fireball the night of the Camelopardalid meteor shower. Thank you, Steve. 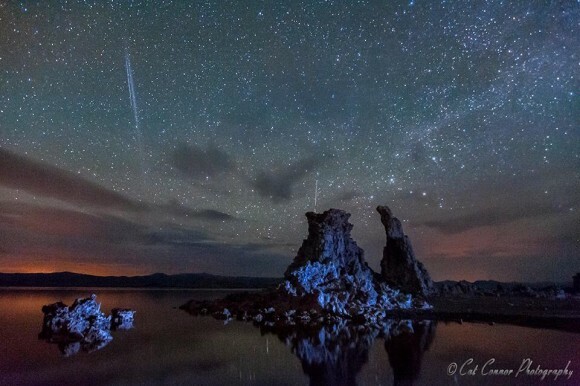 Cat Connor caught some meteors Friday night – the night of the Camelopardalid shower – over Mono Lake in California. The double streak on the left in this shot might be the upper stage of Japan’s Daichi-2 booster venting fuel. Read more about that at Phil Plait’s Bad Astronomer blog. 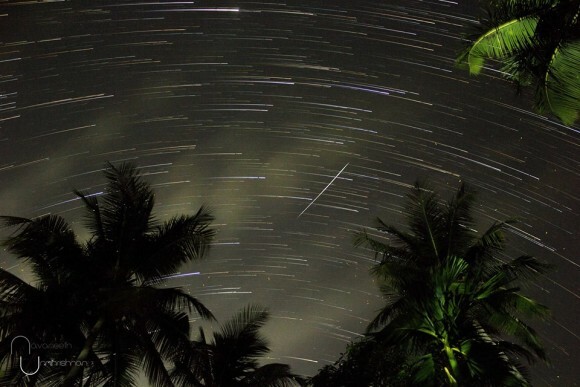 Navaneeth Unnikrishnan said the Camelopardalids meteor shower wasn’t very visible from as southerly a latitude as India. 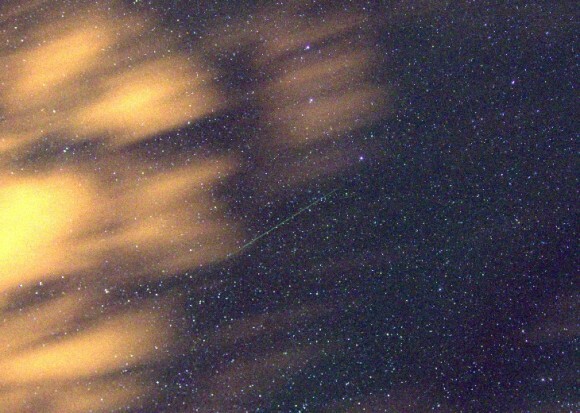 He said, “Here’s a single meteor i got from 401 shots.” May or may not be a Camelopardalid. Thank you, Navaneeth! 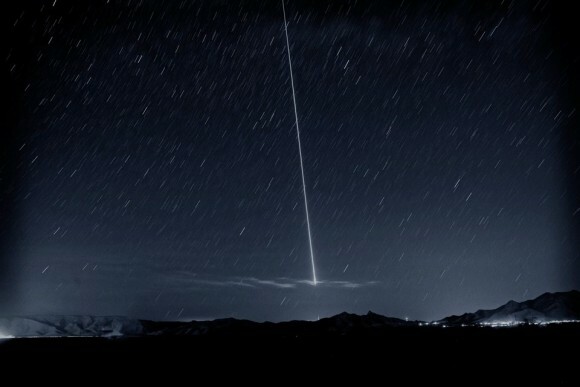 We heard from many people that they saw fireballs, or very bright meteors, on the night of the Camelopardalid meteor shower. 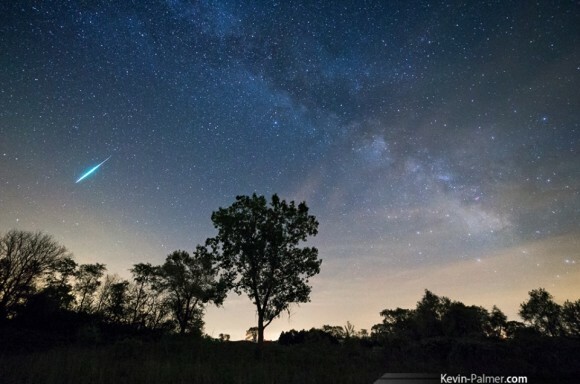 This one is from Kevin Palmer, who was observing from Green River State Wildlife Area in Illinois. View larger. | Glen Wurden caught this meteor on the night of the meteor shower near Los Alamos, New Mexico. 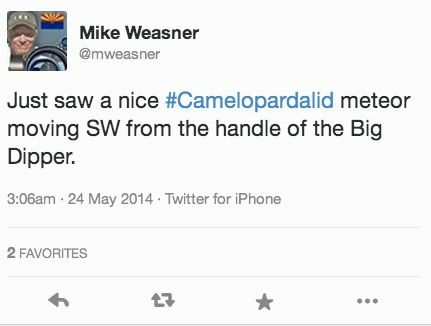 He doesn’t think it’s a Camelopardalid, but it is a beautiful meteor. Thank you, Glen! 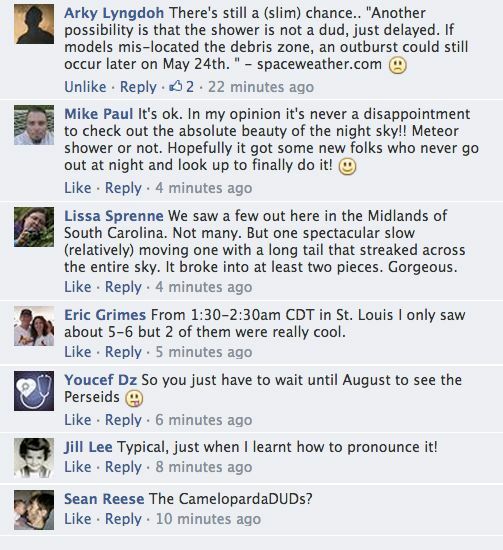 Bottom line: Camelopardalids did not put on their predicted show for observers in N. America, at least. 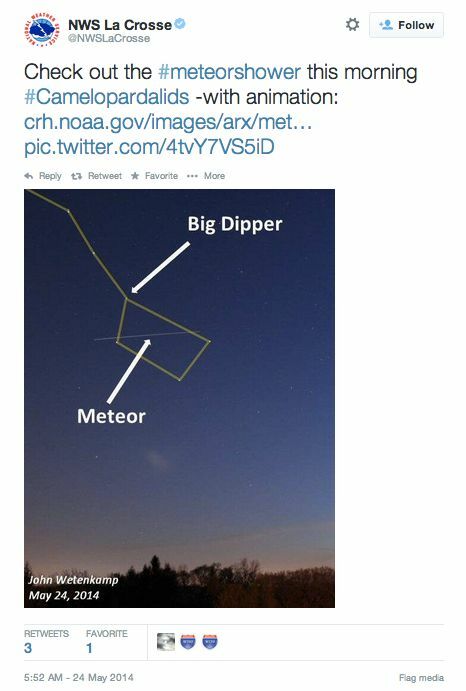 What the heck, astronomers?